Grounded in a holistic view of sexuality, Our Whole Lives not only provides facts about anatomy and human development, but also helps participants clarify their values, build interpersonal skills, and understand the spiritual, emotional, and social aspects of sexuality. Please note that due to the nature and content of the Our Whole Lives program, participation is limited to children and youth who are officially registered and actively participating in the Religious Education program, or children and youth whose parents are pledging church members. For more information about the Our Whole Lives program, please contact Scott Stewart at scott@eliotchapel.org. 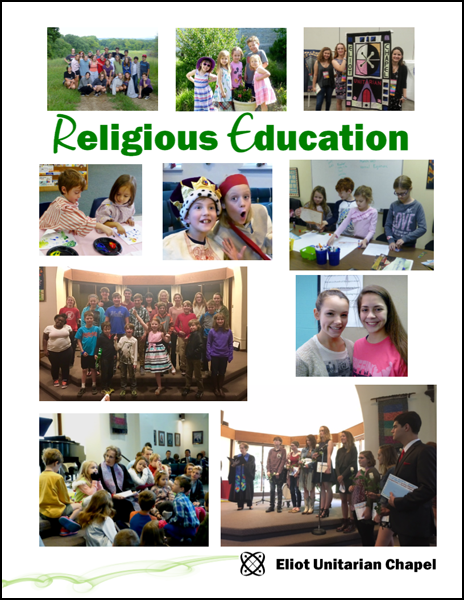 The Our Whole Lives curricula for 7th-9th grade was updated in 2014-15. Click HERE to explore the recent blog from UUA Call & Response titled The OWL Has Landed, by Melanie J. Davis, which explores the new edition, highlights the updated material in the curriculum, and includes links to additional OWL information from the UUA and other organizations. Click here to learn more about the Our Whole Lives lifespan sexuality education program from the Unitarian Universalist Association. What’s religious about sexuality education? Check out the Unitarian Universalist Association's Sexuality is Honored Here brochure, found here. You can explore Forty Years of UU Sexuality Education, which examines the long history of sexuality education in the Unitarian Universalist Association, in this 2011 UU World article by Sarah Gibb Millspaugh, found here. What insights and lessons can children and youth take away from participating in Our Whole Lives? Check out Talkin' About Birds and Bees, by Conor Friedersdorf, a 16-year-old youth who participated in the UUA's K-1 and 7-9 Our Whole Lives program. For Families & Children: Check out the Spring 2014 UU World Family Page which includes stories and activities about our bodies for parents and children to explore together, as well as a Parent Reflection and a personal story from Melanie Davis, the UUA Program Associate for Our Whole Lives.